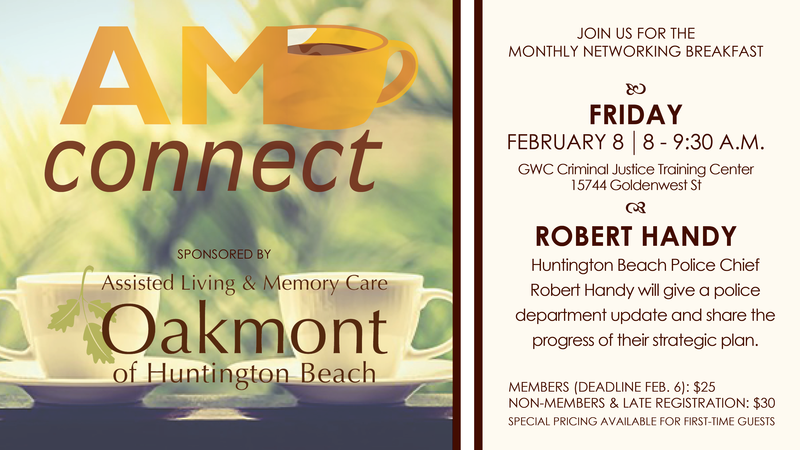 Join us for our monthly membership breakfast this month sponsored by Oakmont of Huntington Beach, and hosted by the Golden West College Criminal Justice Training Center. Huntington Beach Police Chief Robert Handy will provide a police department update and share the overview and progress of their strategic plan. Everyone in attendance receives breakfast, a 20-second introduction, a place for marketing materials and an opportunity to network. Don't forget to represent your company by bringing a door prize for the drawing. All attendees are entered to win the raffle prizes brought in by other business representatives.